A website set up to show that people who still use Internet Explorer are less intelligent has been revealed as a prank. This weekend, a few news outlets including the BBC, The Telegraph and PC World reported on a website publicizing a random study conducted on the internet. A so-called "psychometric consulting" firm called AptiQuant claimed that it drew people to its website to take an intelligence test while also logging the browser those people used. 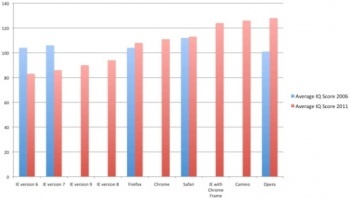 The collated data suggested that users of the various versions Internet Explorer still used by many to access AOL and Facebook were statistically less intelligent than users of Chrome, Safari and Firefox. Who were the smartest? The people who use the Opera browser. That is, if the study was at all real or if AptiQuant was a legitimate consulting firm. In fact, the whole website was a hoax meant to point out the inadequacies of Internet Explorer 6. "This study was a total hoax," read a post on AptiQuant.com. "There is no company called AptiQuant, and no such survey was ever done. We are really surprised that it took so long for people to figure it out, a mere 'whois' on the domain could have revealed it all." The real question is: why bother creating a fake website just to bite their thumb at the people still using IE 6, 7 and 8? Just for kicks? Well, not exactly. "The main purpose behind this hoax was to create awareness about the incompatibilities of IE6 and how it is pulling back innovation. So, if you are still using IE6, please update to a newer browser." The people behind the hoax actually run a comparison shopping website called Atcheap.com and were disgusted when they tried to make it compatible with older browsers. "We got this idea when adding some features to our comparison shopping website. We found out that IE6 was highly incompatible with web standards. IE 7.0 and 8.0, though better than 6.0 are still incompatible with not only with the standards, but with each other too." I personally use Chrome, but I don't think that makes me any smarter. Internet Explorer used to be the gold standard, but it was increasingly frustrating to work with so I gave Firefox a shot. I never went back, and when Chrome debuted, the story was the same. I understand that IE has improved since then but I only bother opening it up when a webpage - usually run by Microsoft - won't open anywhere else. Even Microsoft admits that people should at least upgrade to a more recent version of Explorer.